pie in the sky: Doesn't This Look Like Honey to You? ...Because it did to me. And now I want to die. J and I were wandering around the luxurious ABC Carpet & Homes today, searching for a wedding gift, when we found that they've recently inducted a fancy chocolatier in the back: Chocolat Michel Cluizel. The rear anteroom of ABC, where the chocolate bar is, opens onto three adjacent restaurants (Lucy Latin Kitchen, Pipa Tapas y Mas, and my personal favorite, Le Pain Quotidien), and when ABC closes at night, the chocolatier is only available via those restaurants, speakeasy-in-the-back-room style. They have cute little cafe tables, live music in the evening, thick hot cocoa you can buy in seven-dollar mugs or two-dollar "hits," and a beautiful array of expensive, elegant confections. They don't carry many organic chocolate products or anything free-trade, soI won't be frequenting it (as I can find more ethical chocolate elsewhere), but J and I didn't leave without a frothy, creamy mug of homemade chocolate milk over ice. Mmm! Back up a short staircase and into bustling ABC proper, a tiered display of Savannah Bee Blackberry Honey adorned a table. Now, I've had Savannah Bee honey. In fact, I keep sea salt in the empty bottle - a glass bottle similarly shaped to this one. It's marvelous clover honey. So how excited I was to discover a blackberry version! And in a bottle with a squirt-top - how inventive! And with a tester! How generous! So I squirted some onto my fingers. And then I ate it. I didn't have time to read that barely-legible, squiggly-cursive text reading "hand soap" before I garbled to J (who was about to sample the hand soap himself) "It's not honey!" and bolted for the door, so as to avoid potentially vomiting all over ABC's overpriced carpet & home decor. I frantically dug in my purse, feeling around for some Kleenex to spit in, but if you read my recent meme post you'll notice that there aren't any Kleenex in my purse...so let's just say that sudoku torn out of the newspaper came in handy. Then my throat started burning and I chugged an entire Diet Coke to keep from yakking and all the bubbles made my stomach feel like an overfilled washing machine on the wash cycle and I WANT TO DIE. Gracious, I think my stomach hurts. Gosh, I'm so sorry. It happens. Just think washing a kids mouth out with soap use to be pretty common. Gadfry, you sure make it unappetizing. i wish i was there with you. i could've stopped you and potentially have helped save your tastebuds. 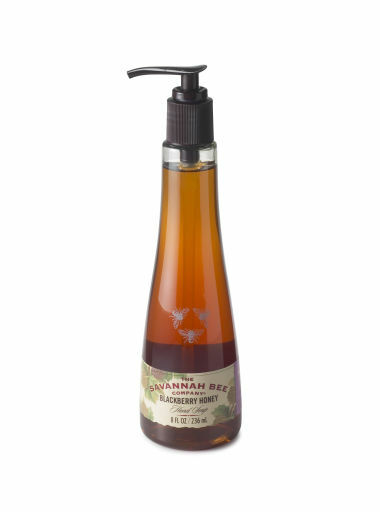 i use savannah bee soap. Looks like honey to me. I would have been really pissed. PAYBACK!!!! PAYBACK!!!!!!! PAYBACK FOR THE CHOCOLATE SOAP BALLS!!!!!! This is karma, dear. Because soap balls aren't edible either. :) Love you dear! If it makes you feel better, I know the lovely, savorery flavor of liquid soap myself. I used to have a set of black dishes (on which you can't see liquid soap), and one fine afternoon I was having some salsa and chips and then as I finished I sqirted a little dish soap on the plate and placed it off to the side to be washed later. About 10 minutes went by (seriously, I apparently have no short term memory) I was passing by the plate and thought "hmmm, a few more chips wouldn't be so bad." So I dumped a little more salsa on the plate, got a chip and scoped up a nice big helping of salsa & Lemon Joy. It was NOT a joy, they lied! Oh, this happened to me once at (shudder) Ren Faire. Some wench (I mean that in the literal sense, not derogatory) was hawking "luscious creams" which I took too literally. Yuck!